AP NEET Provisional Merit List: Andhra Pradesh Medical & Dental Colleges Management’s Association (APMDCMA) and Dr. NTR University of Health Science has announced AP NEET Provisional Merit List & Rank on 25th June 2018 on the official website of Dr. NTR University. All candidates who have filled the registration form can download the AP NEET Provisional Merit List 2018 from the official website as well as from below. Candidates are suggested to keep checking this page for more updates regarding AP NEET MBBS/BDS Admission 2018. Quick update 3/07/2018: Dr. NTR University of Health and Science Andhra Pradesh NEET Final Merit List 2018 has announced today. Candidates can check it from below. Quick Update 25/06/2018: Dr. NTR University of Health and Science has announced Andhra Pradesh AP NEET Provisional Merit List 2018 today on their official website. Candidates can download it from below link. Update 13/06/2018: Today Dr. NTR University of Health and Science has announced List of candidates who studied 10+2 in Andhra Pradesh and appeared for NEET UG – 2018 conducted by CBSE. 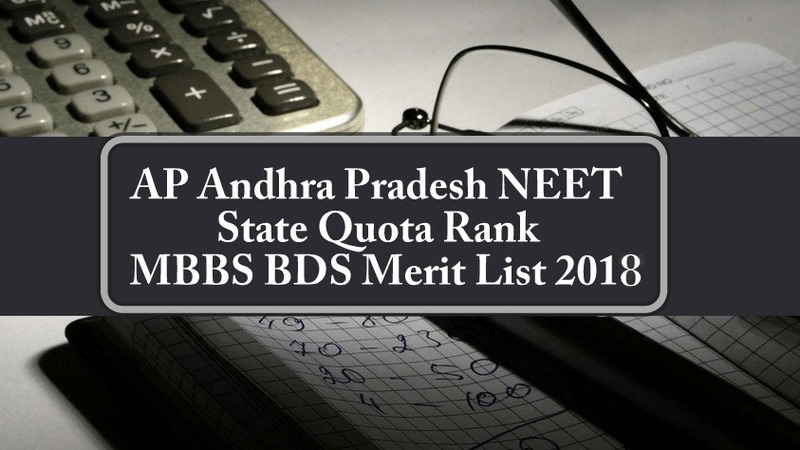 Candidates who have qualified NEET UG 2018 Exam from Andhra Pradesh can check this list. Candidate can download it from below link. Note: This is just a list of candidates who had appeared in NEET 2018 from AP and also studied 10+2 in AP. The merit list will be published after the registration. As per the previous year’s MBBS/BDS admission procedure in Andhra Pradesh, first Central Board of Secondary Education will send a list of candidates who have appeared in NEET UG 2018 from Andhra Pradesh to APMDCMA. And then Dr. NTR University will upload that list on their official website to let people know how many candidates appeared in NEET from AP. After that, Dr. NTR Univeristy will start accepting counselling registration form for AP NEET MBBS/BDS State quota counselling 2018. On the basis of the received application form, University will announce AP NEET Provisional Merit List. Only those candidates will be allowed in counselling whose names will be in the provisional merit list. After publishing the list of appeared candidates, AP NEET state quota counseling registration form had been invited for MBBS and BDS Courses. As we know, there are 3 states who are not participating in NEET All India Quota Counselling 2018. Andhra Pradesh is one of them, that means all govt/private medical and dental seats are reserved for the state candidates. No candidate from other states will be allowed to take part in Andhra Pradesh state NEET Counselling. The online counselling schedule and procedure will be soon published. It is very important to all candidates to fill the counselling registration form. No will be allowed for state quota NEET counselling without registration. Candidates from all over the country are eligible. Candidate must have scored 50th percentile in NEET 2018 Examination. The candidates also shall secure not less than 50% of marks taken together in Physics, Chemistry, Biology (Botany, Zoology) / Biotechnology in the qualifying examination (40% in case of BC, SC and ST) are eligible for admission to MBBS / BDS courses and they fulfill other relevant conditions laid down in these regulations as per Medical Council of India / Dental Council of India guidelines. Candidate should have completed the age of 17 years by 31st December. There is no age relaxation in age for any category candidate. All candidates born on or after 2nd January 2000 are not eligible for admission. Andhra Pradesh NEET State Quota Rank & Merit List will be published on Dr. NTR University of Health Sciences. All candidates are suggested to keep visiting this page for more latest updates. to the University of Notification and after verification of original certificates. I got 2739 state rank in NEET 2017. I come under Andhra pradesh region. Will i get a seat in MBBS in any government college? I got NEET state rank 1800. I don’t have any reservation. Will I get seat under category A? I got 392 marks in neet 2018.Is there any chance to get seat for MBBS in Andhra or in any other state. I belong to oc category. I got 287 will any hope to get medical seat in Andhra or Karnataka plz..??? i got neet all india rank 62254. i am bc -b will i get mbbs govt seat or mbbs category-A Seat in A.P?? i got 62298 neet all india rank.i am bc-b will i get govt mbbs seat in A.P? can I get MBBS A category seat in ap? I got 358 marks in neet 2018 in SC category. Do I have a chance of getting MBBS seat . I am from Andhrapradesh. Yes, You can get MBBS seat through state counselling. my daughter got 325 marks in neet 2018 in BC-E category . Do I have a chance of getting either a mbbs or bds seat in convener quota. I am from ap. I got 495 marks in neet 2018 and i’m OC .Can i get a medical seat in A category in AP?? My name is Hema lalitha . R I got rank 383557 in neet exam, belongs to obc,can i chance is any course for free seat thank’s u. Got 505 in neet 2018. I have BC-E .wht are the chance to get free government seat ..
My name is Bhargav. I got 85803 rank in all india. I m from Ap and i belong to category SC. Can i have chance in getting Mbbs seat??. I got 414 marks in oc category.iam AP. Can I get seat in A category. Please clarify – if any body joins in 15 % national pool quota for MBBS in other states all over India is they become nonlocal for our AP state later appearing for post graduation ? last year(2017) my daughter got 436 marks in NEET. She didn’t get A category MBBS seat either in Telangana or Andhra Pradesh. She joined in B Category at GSL Medical College Rajahmundry. Wht happen to ap meet merit list? When will come NEET 2018 state result list? When ap local tanks commence? I am a native of andhra i scored 10,691 rank in st category all india wide will i get a seat in ap? Who can apply for national pool ? Up to which rank does OC students got mbbs seat in 2017? My Andhra Pradesh state rank 1098. First of all, AP State rank is yet to announce and are you qualified in NEET 2018? Sir, I’ve studied in AP till my 10th and I studied 11th and 12th in Karnataka. When do I register for AP counselling and when do I get my rank? I got 540 marks.Neet rank is 9571. State rank is 493 .which college I get seat.Iam ur category.